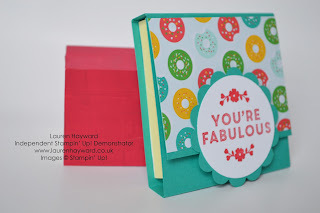 I've used the fabulous new Cherry on Top Designer Series Paper and the Hostess Set "A Whole Lot of Lovely" to make this beautiful colour co-ordinated, bright post-it note holder. It doesn't take a lot of materials but really does look fantastic and I hope it will brighten someone's day! Below are the materials I used along with instructions and a PDF download for those who want to make it at home. Cut base card to 10"x3.5"
Score on the long side at: 2 5/8", 3 1/8", 6 1/4", 6 3/4"
Seal with velcro dots if required. 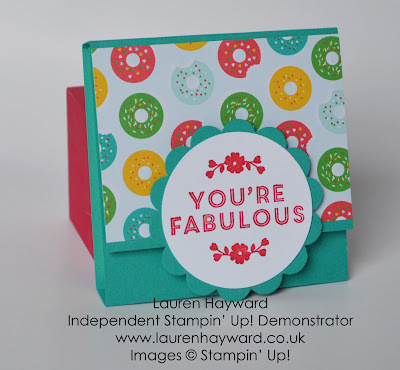 cherry on top dsp post it note project stampin' up!